The printers in the HP Laser jet 6 series are aimed at workgroups that need a robust and reliable monochrome device. The HP LaserJet 6 series printer promises good speeds and offers wireless connectivity as an option for a more convenient set-up. However, the HP LaserJet 6 mono laser printer is often criticised for being slow and somewhat noisy. The HP LaserJet 6 line is composed of boxy, space-saving printers measuring an average of 15.7 inches wide and 17.5 inches deep. 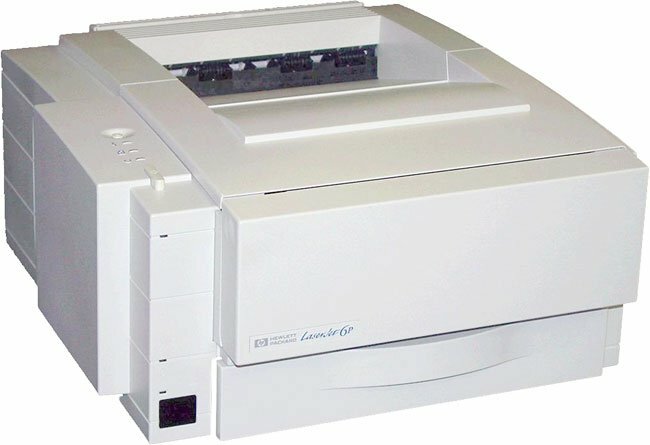 Designed with a stationary form factor and aimed at workgroups, most of the models in the LaserJet 6 line offer both wired and wireless connectivity, with the main interface being a parallel 36-pin centronics and a mini-centronics port. Users may increase the RAM to 50MB with the 3 expansion slots available. The printers in the HP Laserjet 6 range can print on labels, envelopes, and transparencies, too. The total paper capacity is about 250 sheets of A4-sized media. Most models have infrared ports for wireless printing. The Hewlett Packard LaserJet 6 can use a high capacity black HP 98X laser printer cartridge. This can be replaced in the machine by a cheaper compatible LaserJet 6 toner cartridge which isn't manufactured by HP but has been cleverly designed to do an equally effective job. PostScript support is optional for the HP LaserJet 6 printer line, and the maximum resolution is limited to 600x600dpi. Print speeds are unimpressive at only up to 8ppm, which is slower when compared to other laser printers. The HP LaserJet 6 laser printers only have 2MB of RAM.